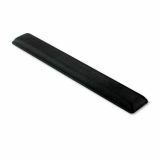 Fellowes Gel Wrist Support, Graphite - Wrist rest provides exceptional support while redistributing pressure points. Soft, durable Lycra&reg; covering withstands daily wear and tear. Non-skid base holds wrist rest firmly in place.